When he was crowned, at 14, his father was still alive, and his mother Isabella and her lover Roger Mortimer ruled as Regents. He was tall and handsome, with red-blonde hair. He was the ideal knight, strong, aggressive and skilled at feats of arms. He liked magnificence in dress and kept an opulent court. Edward had no instruction in kingship but learned from the Regents what not to do, and read widely in English history. He fought the Scots and the French, including the famous battle at Crécy in August 1346. Edward put heart into his troops, riding up and down their ranks on a warhorse, and the battle was won. 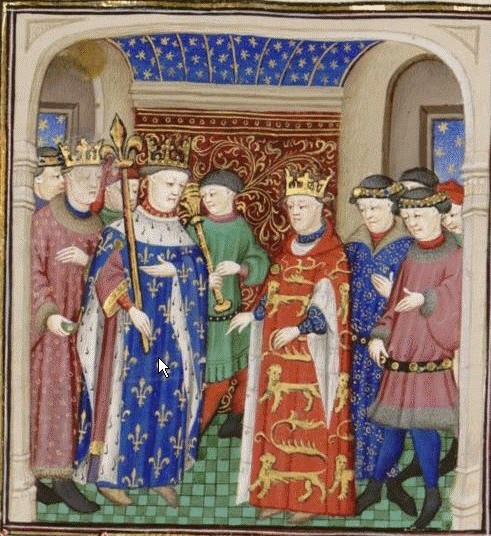 He had such a splendid court, and was so lavish, that he was compared to King Arthur, and in the manner of the Round Table, in 1348 he inaugurated the Order of the Garter. At the moment of his greatest success, the kingdom was struck by the Black Death. One third of the population died including two of his children. When the plague was over, Edward and his grown sons fought in France again, and eventually gained Aquitaine in return for renouncing his claim to the French throne. Edward had the misfortune to outlive his glory. In his last years, weak and feeble-minded, he fell under the control of his Chamberlain and Steward, who enriched themselves at his expense and tarnished the high reputation of the court. When he died he was alone. His mistress Alice Peres came, not to comfort him, but to steal the rings from his fingers.